It’s been a long time since there has been a major Pro Stock race in New England without a yellow, red and purple #00 in the field. 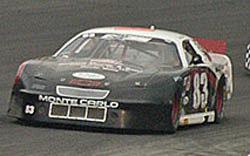 But Ben Rowe’s familiar racecar was missing in action at White Mountain. Rowe was there. In fact, he won the race. 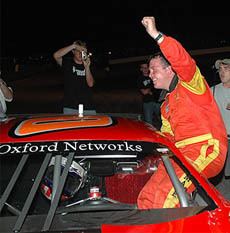 His team was there right behind him as well, but instead of the #00 they group borrowed the #10 of Oxford Plains Speedway regular Chris Kennison. The plan worked because they dominated the race. Getting to victory lane wasn’t easy though. "It wasn't really supposed to go like this,” said Rowe. 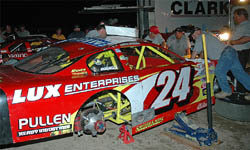 “We tore the right front off the car at Unity, and Thursday I asked Chris (Kennison) to help me out. He said 'Sure, and maybe you can find out why I'm not winning while you're at it.' So we came here just to get points and help Chris find what might have been wrong with his car, and we won the race. dense air comes in at night, the second groove at this place is good. Usually at most other tracks that's not the case, but here you can make it work, and Chris' car was great. This whole thing is pretty neat." Also in an unfamiliar place at White Mountain was Cassius Clark. He was wheeling his regular #8 ride, but was uncharacteristically struggling in the middle of the pack. Clark finished 11th. The #8 team tried to improve their car in practice and ran out of things to do on it. Alan Wilson has put together a good string of solid finishes over the month of July. White Mountain continued the streak with a seventh-place finish. time, I guess. Next time we're here, we'll pick up from where we left off tonight, and I think we can get a good finish." Wilson raced for over two decades at Oxford before going out on tour. He’s a rookie in the IBG-PASS Series and that is something new to him. "It's kind of neat, I guess, I try not to focus on it too much, though. The best part is that were going for it against Donnie Lashua. It seems like we run together on the track every week, and he is just the nicest guy in the pits. I really like racing with him." Next up for Wilson is the TD Banknorth 250. Johnny Clark had a strange day. He unloaded slow, got fast and then slowed down again in the feature. But, he still finished fourth despite the roller coaster day. Clark brought his car back to the team’s shops to try and figure out what went wrong. If that fails, it might just have to be towed to the family business of one of his competitors. Johnny Clark’s wrecking yard. “I don’t really understand what happened today,” said Clark. “We had a horrible car in practice and then we bolted on sticker tires in time trials and we spanked them on the first lap. I don’t really get it. We got the pole by half a tenth on the first lap. Gordon (#14g) races with the #10 of Ben Rowe. Tracy Gordon finished in second place at White Mountain. Usually, the scrappy Maine racer isn’t satisfied with anything but a victory. Finishing second this time out though was enough to keep him happy. "The car got really tight in and loose off,” Said Gordon. Eric Chase showed up for White Mountain with his ACT Late Model and a fast burn engine to compete with the more powerful Pro Stocks. He debuted his combination at Oxford and finished sixth. At White Mountain, he was 13th. “At first I thought I had a tire going down by the way the car acted. I pinched Benji a little so I could try to stay up in the lead, but he got me. I thought it was a good race, I'll take it." Mike finished third and even though he won’t have bragging rights at the family table over his son Ben, he was happy knowing that he got the best result possible. There was a little consolation for Whitten’s Richard Moody-owned team in running well, but it was still a tough day in the end. “We’re doing good, but a lot of guys are having problems too,” said Wilson. “We’ll have ours too, I’m sure. We’re happy. This is about the first race that we’ve gone home from without stoving the car up. Clark gives the PASSers high marks for putting on a close and clean race in front of the White Mountain crowd. Especially given the fact that there have been several high profile incidents and accidents this season. Travis Benjamin has shaken a monkey off his back in recent weeks. He has moved to sixth in the point standings after enduring a number of early season problems that ended good runs early. At White Mountain, Benjamin finished fifth. “We had a real good car,” said Benjamin. “It was loose up off the corner. Once we get that figured out, we’ll be better. It could be tires, but I think it’s chassis. We were good in practice and then we time trialed 15th. In the last seven weeks, the worst that we qualified was fifth so I was disappointed in that. “We knew that we had to be patient. We’re finally starting to be patient. Three out of our last four races we were fourth, fourth and fifth. We’re letting these guys come to us. They might be faster than us at the beginning, but we’re fast later on. We’re getting up front where we belong. After five or six years, we’re finally getting the budget that we need and we’re getting organized. Donnie Whitten was knocking on the door of a top five finish when his car started spitting out coolant. He was eliminated from the race in the late going due to overheating problems and finished 17th. after we got lapped in that spin. It's too bad that we got in that deal with the 97 [Walt Hammond], because they never ran away from us all night." Corey Williams also pitted several times to adjust the handling on his #47 car. However, his finish wasn’t quite as good at the end. Williams came home in 14th. Eric Chase's #40 runs in a pack at WMMP. Clark paces several cars in practice with his #54. "I had nothing for Tracy at the end, the car just wasn't there,” said Mike Rowe. “I think the sway bar was a little too loose for my liking. At least we didn't tear the thing up." Rowe is now in the thick of a battle between himself, his son Ben, Johnny Clark and Cassius Clark for the IBG-PASS Championship. Are points on his mind at all? "Am I thinking about the title? Yeah, I hope so,” said Rowe. “The problem is my kid, I can't get away from him!" Richie Dearborn didn’t have an especially strong race and needed to pit a few times to fine-tune his car. But he stayed out of trouble and used his head at White Mountain. For his efforts, he was rewarded with a finish of sixth. Mike Rowe's SP2 team gets to work.